Published: Sept. 13, 2018 at 06:58 p.m.
Can't-Miss Play: Bengals fake punt succeeds for a 49-yard gain! 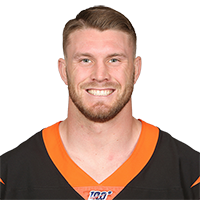 Published: Aug. 9, 2018 at 11:01 p.m.
Cincinnati Bengals safety Clayton Fejedelem takes the snap for a successful fake punt and a 49-yard gain. Published: Oct. 1, 2017 at 02:08 p.m.
Cincinnati Bengals defense comes up strong, as safety Clayton Fejedelem gains first career interception off pass from Cleveland Browns quarterback DeShone Kizer.